Information: This is perhaps the most common use for hangtags. They provide essential information for customers, such as the price, garment name, size information, and a barcode that allows you to track inventory and sales in your store. These tags tend to be simpler because their function is primarily for sale and inventory. You could also include product information or company information, such as a short anecdote or company history, or a snippet about the fabric you use or the quality you strive for. Customers tend to appreciate the personal touch, and will feel like they know your company better than if it had simply contained a size, price and barcode. Branding: Custom clothing labels and hangtags are a perfect way to reinforce your style and brand, and can help to create a cohesive company image for customers. Include your normal logo and colors with a clean design if you are intending on using your hangtag for branding purposes, and print it on thicker paper. 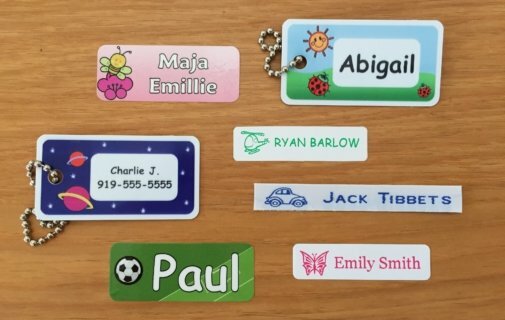 Promotional: These hangtag name labels tend to be extra promotional items, like sticker hangtags or key chains. These are the perfect way for you to give your customers a little something extra and cultivate goodwill. Customers will remember the gesture and are likely to return.